We have 50-60 partner locations throughout Southern Maine and New Hampshire. Learn more or find a location near you! February & April Vacation Camps are being offered in Portland, Lewiston, & Newfields, NH! Summer Camp registration for Portland, Saco, & Yarmouth locations begins tomorrow! 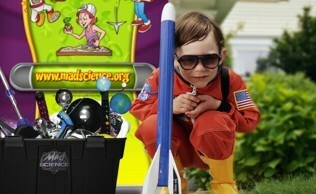 Mad Science Is All About Making Learning Fun! Mad Science is the leading provider of hands-on, interactive science enrichment programming for children ages 4-12 years old. 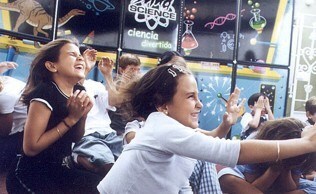 Mad Science was established in 1985 and has been operating in Maine since 2001. We are all about sparking children’s imagination through scientific discoveries. From rockets to robots, science can be found everywhere! Children are delighted and excited when they learn to explore and experience the scientific world around them through our lively, hands-on science programs. Our services have allowed students to cultivate their budding interest in science by turning abstract scientific concepts into engaging, tangible experiments. 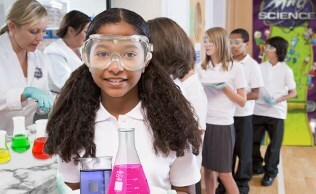 It is our mission to foster an enthusiasm for learning and critical thinking in every student by bringing science to life! One of the best things about us is our ability to partner with local schoolsl, community organizations, businesses, and parents to offer exceptional services to children throughout our region. We currently offer a large selection of fun science programming in various formats and locations throughout Maine and Southern New Hampshire. NASA and Mad Science team up to bring you Opsparc! Mad Science and NASA Team up to bring you OPSPARC 2018! Let kids ignite their creative thinking with the OPTIMUS PRIME Spinoff Promotion and Research Challenge! Let us know how your program went! Corey was absolutely amazing! One of the best shows I have seen in quite awhile. Kids and Parents were entertained, I would have Mad Scientist back in a heartbeat!